Coral reefs are living rainbows under the seas, but they may not remain there in the future. According to a report by the United Nations Educational, Scientific and Cultural Organization (UNESCO) a while ago, these wonders – from the Great Barrier Reef off Australia to the Seychelles near East Africa – may not exist in another three decades. Reef experts insist that of the 29 World Heritage reef areas, at least 25 of them will undergo serious bleaching every five years by 2040. The causes of this irreversible damage are acidification of the oceans, dynamite fishing by humans and global warming. But there is good news from Israeli researchers – the only place in the world where they are surviving these harsh conditions are the Gulf of Aqaba, the Gulf of Eilat at the northern tip of the Red Sea, east of the Sinai Peninsula and west of the Arabian mainland. Living corals are home to nearly a million species of colorful creatures, including fish, algae and invertebrates that make the reefs look like patchwork quilts. They are among the most complicated ecosystems in the world, even though they take up only 0.2% of the ocean floor. Jessica Bellworthy, a doctoral student who carried out the study in the laboratory of Prof. Maoz Fine at Bar-Ilan University in Ramat Gan near Tel, along with scientists from Ecole Polytechnique Fédérale de Lausanne, recently published their findings in the Journal of Experimental Biology. 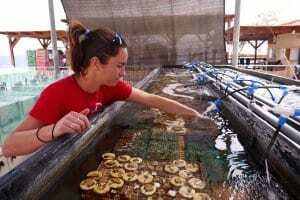 The researchers discovered that even when parent corals from the Gulf of Aqaba experience increased temperatures and ocean acidification stress during the peak reproductive period, they are not only able to maintain normal physiological function, but also have the same reproductive output and produce offspring that function and survive as well as those which were produced under today’s ambient water conditions. While only one species has been tested for one reproductive cycle so far, this is a success story that shows that corals in the Gulf of Aqaba may survive despite climate change. Bellworthy, of the university’s Mina and Everard Goodman Faculty of Life Sciences, and her team used a Red Sea simulator developed in Israel for their research. They carefully and accurately manipulated water conditions in Fine’s lab at an 80-aquarium, high-tech facility located at the Interuniversity Institute for Marine Science in Eilat at the southern tip of Israel to mimic the ocean under a severe climate change scenario. “To our surprise but also joy, there were no detected differences in the number or the quality of the offspring produced under ocean acidification and warming scenario compared to the present-day ambient control conditions,” declared Bellworthy. Previous work in Fine’s lab showing the corals’ resistance focused solely on their adult life stages. This led the researchers to investigate the impact of climate change and ocean acidification on the reproductive performance of the adult population and on next-generation corals. The world’s coral reefs are degrading largely because of human activities, they wrote. Under these stressors, their ability to survive depends upon existing phenotypic plasticity (the ability of an individual organism to alter its physiology and structure in response to changes in environmental conditions). This ability is particularly important in plants, whose being fixed in one place requires them to deal with conditions around them. Their survival also depends on the adaptation of one generation after another. This study exposed mature colonies of the common reef-building coral Stylophora pistillata from the Gulf of Aqaba to seawater conditions likely to occur just beyond the end of this century during the peak spawning season. The Bar-Ilan researchers plan in the coming months a similar experiment combining global and local harmful factors, such as ocean warming and heavy metal pollution that will investigate how local factors affect the ability of coral reefs to withstand climate change.